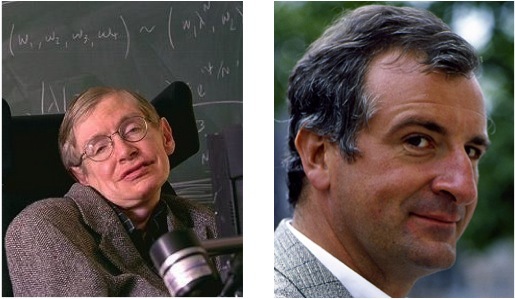 You probably recognise the people in these pictures: cosmologist Stephen Hawking (on the left) and the late comic sci-fi writer Douglas Adams (on the right). You might be wondering why their pictures appear side by side in this blog and what – apart from an interest in matters scientific – they could possibly have in common. To my knowledge, they share at least three important attributes. For a start, they both wrote hugely popular and best-selling books which asked questions about life, the universe and everything. Hawking – A Brief History of Time – told us that origin of the question was a singularity whilst Adams – The Hitchhiker’s Guide to the Galaxy – declared that the solution to the question was 42. Given that life is very complicated, the universe is awfully big, and that Hawking and Adams followed somewhat divergent methods, a difference of only 41 seems quite insignificant. Second, they both extended the theoretical possibilities for space travel. As a space buff since my early childhood, I have been fascinated by the possibility of “boldly going where no man has gone before” since Star Trek was a mere glint in Gene Roddenberry’s eye. Personally, I much prefer the unlimited options for cruising the space lanes provided by the “infinite improbability drive” installed by Adams in Zaphod Beeblebrox’s stolen spaceship Heart of Gold, to the certain prospect of being infinitely (and fatally) stretched by the gravitational effects of one of Hawking’s black holes. Third (and only now released into the public domain): I went to school with both of them. It would be stretching the truth to say that we were friends (or indeed to claim that I actually knew them) but it is a fact that Stephen Hawking was in his final year at St Albans School in 1961 when I was a first former there, and that Douglas Adams was a new boy at Brentwood Preparatory School in 1960 during my fourth and final year as a boarder there. I only discovered this recently and I have since been puzzling about its significance (apart from making my name the winning answer to an especially arcane question in a pub quiz). In particular, I wonder how the course of history might have been changed if only I had introduced them to each other at an early age. How might our understanding of the space-time continuum have been revolutionised if – through my agency – the world’s greatest scientist and the world’s greatest (at least the world’s funniest) science fiction writer had joined forces? Might it have been humanity (rather than white mice, as Adams claimed) that evolved into hyper-intelligent pan-dimensional beings? Occasionally, while I am lying awake in the wee small hours, fretting about such missed opportunities for humankind, it occurs to me that having been at the same schools at the same times, we must have had the same teachers. Thus, Stephen Hawking and I would both have been taught Physics by the redoubtable ‘Percy’ Pryke at St Albans School, whilst Douglas Adams and I would both have enjoyed lessons in English (and story writing) from Mr Higgs, the moustachioed headmaster of Brentwood Prep. But what really keeps me awake at night is the question I can hear you asking yourselves right now: why – when Hawking, Adams and I have such distinguished teachers in common – is the name Geoff Mead so rarely mentioned in the committee rooms of the Royal Swedish Academy when the Nobel Prizes for Physics and/or Literature come up for grabs? The only explanation I have been able to come up with so far is that I must have nodded off in class during some of the important bits. For which I blame the teachers. Thanks Geoff – a smile making read! Better (and shorter) than the Sunday papers. I was at school with a winner of both Mastermind and Who wants to be a Millionaire (or whatever it was/is called) Makes one think. Maybe I should have watched more TV.